The types of beautiful, elegant Indian wedding gowns range from traditional red saris to modern white wedding dresses. The color and style depends on region and cultural beliefs. Many Indian brides prefer gowns of gorgeous embroidery and fine, delicate fabrics. For Indian brides who really value tradition, there's only one choice for their wedding day. The red wedding sari is popular all across India, as well as in many other countries, and it's the traditional choice for Indian brides of all the major religions, including Hindus, Muslims, Sikhs, and Christians. This beautiful garment, which is usually constructed of deep crimson silk, is embroidered all over with gold thread. Although most wedding saris are silk, modern Indian brides sometimes choose other fabrics like satin, crepe, or Georgette. Although red is the traditional choice, it's not the only option for Indian brides. In fact, many modern Indian women choose wedding saris in other beautiful colors. Typically, these saris also feature the elaborate embroidery and embellishment also found on traditional red saris, and they are also often made of silk or other fine fabrics. Comprised of a cropped, short-sleeved bodice and a separate skirt, the lehenga choli is a traditional choice for Indian women at many special occasions, including their weddings. The lehenga choli is an especially popular choice in North India. Many Indian brides, especially those who are Christian, dress in a white wedding gown for their wedding ceremonies. These gowns often look similar to those found at most weddings in the United States or Canada; however, they may feature a more modest neckline. India is a huge country, and the people speak a variety of different languages and associate with a number of different religions. According to Exotic Indian Weddings, these cultural differences can affect a bride's choice of wedding dress. In addition, location-specific traditions can influence women who are choosing their wedding clothes, and some Indian brides wear multiple outfits for the ceremony and reception. Conservative Muslim brides and those from other conservative cultures may choose to cover their heads during the wedding ceremony or at all times during the day. This covering can take the form of a beautiful headpiece or veil, or it may involve the dress itself. Modern Christian brides often wear white wedding gowns. These sometimes feature a conservative cut, but they may also be very similar to Western wedding gowns. 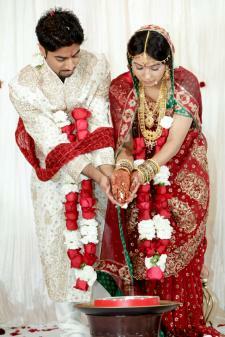 For Indian women living abroad, the wedding may be all about mixing local traditions with their own cultural heritage. Often, these Indian brides choose to wear a white gown for the ceremony and a traditional red sari for the reception, or vice versa. Some women may choose to wear their mother's or grandmother's wedding sari or gown. Sometimes the style of the gown is changed slightly with new embroidery or embellishment. Red continues to be a favorite for Indian wedding dresses. Since this color has religious and cultural significance, this selection is likely to stay in vogue for the foreseeable future. However, newer and softer shades of red are slowly but surely making their way into the Indian bridal lexicon. Also, designers are offering a greater selection of Indian wedding dresses and jewelry with a more delicate design. Another interesting trend is the fusion of Western style with traditional bridal themes. Some modern brides are choosing to pair cleaner lines with the traditional elaborate style of previous generations.